Many people have lost their teeth to accidents and injuries, tooth decay, periodontal diseases and gum infections among other factors. A full set of teeth in your mouth is an essential part of your appearance, speech and even ability to properly eat and digest your food. At Humming Bird Dental Studio in Richmond Hill, we understand the importance of good oral health in everyday life and giving our clients the smile they desire and deserve is our aspiration. Losing some or all of your teeth can affect how you talk, prevent you from eating certain foods and reduce your confidence since your smile is an important part of your appearance. Missing teeth also collapses the cheeks making your face look more hollow and aged. In case you have lost some of your teeth we offer missing teeth replacement services in our full service dental studio. We use several treatment procedures to replace missing teeth at our dental studio depending on your individual situation. A dental bridge is a tooth replacement procedure where we use a false tooth to replace the missing one. The two adjacent teeth next to the gap hold the dental bridge in place. We take molds of the adjacent teeth, create new crowns for them using a composite material that is similar in color to the natural shade of your teeth, and attach these two crowns to both sides of the false tooth. The dentist bonds the false crowns to the abutment teeth to hold the dental bridge in place for the missing tooth. There are various kinds of dental bridges available from our dental studio including the kind that hold the false tooth when there is only one adjacent tooth. In case the tooth was extracted from the root, a dental implant is the best option for tooth replacement. A dental implant made of titanium is drilled into the jaw and a false tooth or crown attached to the top part of the implant above the gum. The tooth sits in place quite naturally and is quite easy to maintain. Dental implants take a while to install and heal properly and you will need a couple of visits to the office before the procedure is complete. However, dental implants and crowns are extremely durable and blend in well with natural teeth. We can also use dental implants to hold dental bridges when there are multiple missing teeth in a row. We use dentures when there is much more substantial damage to the teeth and jaw. 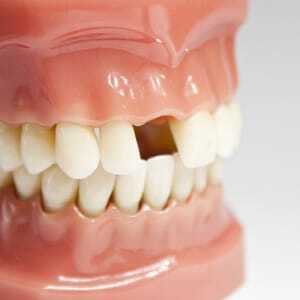 We can create a plate or frame with a full set of false teeth for the upper or lower jaw to replace missing teeth. The dentist can mold the denture plate or frame to restore the structural damage to the jaw where dental implants cannot be installed.